My first impression of Google Chrome was not so good.The first time when I downloaded and started using it, felt very uncomfortable without the Google Toolbar. 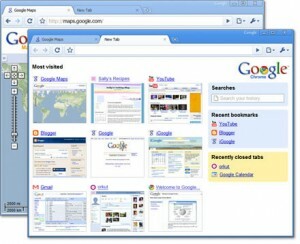 I got so used to using Google toolbar and my first thought was this browser is not for me at least for time being. So after a few hours I was back to Firefox and IE 7. Google Chrome - Best browser ? of Chrome doesnt allow support addons or extensions and does not have a separate toolbar like Firefox or IE. Maybe this might or might not change in future versions. keywords and help you in searching. One more notable feature is the ‘ Browsing history view ‘ when you open Chrome, It brings up to nine most visited website thumbnails, and most of the time I use these thumbnails to navigate these websites. This is definitely a very useful addition. The incognito tab option, which is basically private browsing which would allow any tracking files(cookies) to be stored in your computer or wouldnt leave any browsing history / Search history in your computer. Chrome also maintains browsing history in a calendar fashion with thumbnails and allows to search the browsing history. The browsing history can be deleted by day or completely. Though Chrome doesnt have many new features now it has replaced Firefox in my laptop as the primary browser, I still use IE for what I used it for even before I got Google chrome. Nowadays I mostly dont use Firefox, this could be because firefox isnt faster or lighter anyomore and Chrome offers what I need. I believe Chrome will definitely eat into Firefox’s market. Have you tried Firefox 3.5? It’s much faster and better than previous versions of Firefox. Google Chrome is a HUGE resource hog compared to Firefox 3.5. Personally, though I use Chrome, it has to be my most hated webbrowser ever. I’ve used a lot of incompatible browsers and Chrome has to be the WORST by far. It hates forms, it hates Flash, it hates Windows, it hates the world. Half of the time it does stupid things with forms (such as when I hit submit, it just refreshes the page or doesn’t sent and erases all fields), then it’ll just completely ignore most Flash-based web apps. Moral of the story is if you want a good, strong WORKING webbrowser, Chrome isn’t it. I’ll be surprised if it even posts this comment here. I installed Google Chrome, and it was lightning fast and I decided… “Cool!”. Well after a while my laptop slowed down and got slower and slower. I did some troubleshooting, and it looked like I had a virus, so I did some hunting for it, found it, and got rid of it. Well the pc speeded back up again, but then I noticed that I would click on things and put in a URL, only to have the page switch back to the Google search page… RIGHT IN THE MIDDLE OF WHAT I WAS WORKING on. This problem got worse and worse. It would switch to Google, or switch to my Yahoo mail. I would click on an email, and it would go back to the Yahoo mail page. I deleted Google Chrome, and Zonealarm caught a program later trying to access the internet, some installer program with the name Google something .exe on it when I used my IE. Well, about the same time, my webpage would get hijacked again and end up on Google, or my Yahoo mail again. By this time, I’m getting realllly ticked off, because I have some work to get done and I don’t have time for this B.S. Well I finally got Google to stop trying to take the control of my pc away from me… and now my IE is stuck running without addons enabled, and I am not sure how to fix it. I try to watch a video and it says I need to download Flash. But right after I download Flash, it doesn’t recognize that I downloaded it. It just gives the same error message, over and over again. I noticed that right after I installed Google Chrome, my IE was doing this, but I didn’t think it was that big of a deal at the time, because Google Chrome was playing the videos just fine. I figured it probably borrowed or was using the programs and they would revert back to IE after Google Chrome was gone. Not so. Google Chrome is the most OBNOXIOUS software I have ever put on my pc. for example Firefox- a really neat and slick browser, and it has addons! but wait! what happened?! all those addons are slowing my Firefox at both cold and warm start! what can i do? i can remove the addons, but i wont have the features they offer anymore.. is there another resolve?? yes, there is – Google Chrome 4.0 – even if you install EVERY SINGLE addon on the addons gallery and meny more unofficial found on the web, it will still load for 2 seconds in cold and 1 second in warm start.. so Cheers for Chrome!!! having bought a HP pavillion dv4 tried every browser on here. Both IE8 and Firefox crashed and have needed several re-boots just to get the damn thing running again. I thought, why not try chrome? I expected it to be just as unreliable and ………….. with windows 7 it is by far and away the most stable system, I have not had one problem and quite honestly as not the most knowledgeable computer user, I am impressed. I am quite certain it probably says more about windows 7 but for my experience alone, chrome has been superb. It would be interesting to know how other windows’s 7 user are getting on with other browsers! I have been a firefox user for years and a die hard firefox fan. But every since version 3.0 and up firefox has been a memory hog even with no ad ons installed it starts out slow then the more its running the more memory it pulls untill it finally crashes. I hate this to happen to firefox and I hated to do this. But chrome really impressed me on how fast it loaded and how little it uses. I hated doing it But I switched from firefox to google chrome. Chrome is definitely better than firefox and IE. I run on Vista and I have not had any problems with it and my computer has actually gotten faster from it. Before Chrome I used firefox and it always crashed and I could not use facebook. Now faster internet makes me a happier person. make a difference. It is an adventurous game filled with fun and excitement.